Hap Tu Thai, left, and Ai Cam Tran resolved to erect a memorial for boat people who died attempting to escape from Vietnam. Saturday will mark the dedication of the memorial at Westminster Memorial Park in Westminster. WESTMINSTER – Cam Ai Tran and Hap Tu Thai and their two children escaped from Vietnam by boat in 1979. They had to each pay eight ounces of gold to communists to let them go. But it still wasn't easy. Thai and Tran were packed into a small boat, which left the shores of Vietnam with 250 people and very little food and water on board. They didn't make it too far. The boat capsized not far from Hai Nam Island in the South China Sea. Thirteen people died, but Thai and Tran along with many others swam ashore. The survivors then buried the 13 dead at sea. It was on that day the couple resolved to build a memorial for the boat people – tens of thousands who died in the high seas as they tried to escape communist Vietnam after the Fall of Saigon in April 1975. On Saturday, the couple will have accomplished what they set out to do nearly three decades ago. The Vietnamese Boat People Monument will be dedicated at 1 p.m. in Westminster Memorial Park's Asian Garden of Peaceful Eternity. Tran says it has taken 10 years of fundraising to build the memorial. But, she says, they have refused to accept money from the public or families of the deceased boat people. "This is our way of honoring them," she said. "They have been through enough grief and suffering." 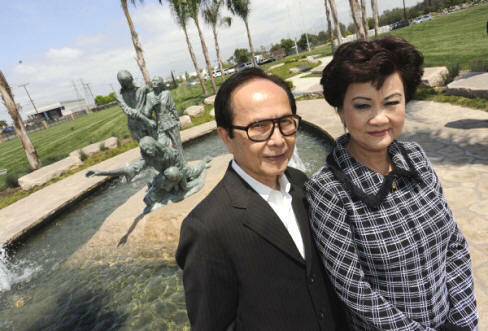 Tran and Thai are publishers of Rosemead-based Saigon Times. The monument consists of four bronze statues – of a man, a woman with her hand outstretched as if asking for help and another woman holding a baby. The statues were crafted by Vietnamese artist Vi Vi. The memorial is surrounded by 54 blocks of stone on which the names of more than 6,000 deceased boat people are engraved. The survivors, many of whom settled in Orange County, lived to tell the story of their daring escape. But those who died remained anonymous heroes, Tran said. "That number is actually much higher," she explained. "Thousands perished in the sea, entire families were wiped out. We don't know anything about them. May their souls rest in peace." The memorial is a perfect fit in that section of the cemetery, where many local Vietnamese Americans bury their loved ones, said Jeff Gibson, general manager of Westminster Memorial Park. "It is saddening to hear about the number of lives that were lost," he said. "It seems to be a perfect way and perfect place to honor those lives." Saturday's ceremony will also include the release of 100 doves as a prayer for the boat people who perished. Catholic priests, Christian pastors of various denominations and Buddhist monks will also say prayers for the souls of the thousands dead, Tran said. "We really believe that this memorial will be the final resting place for the souls of those brave people who wanted nothing more than to be free," she said. "They died for freedom." Son Hong Le, a doctor who has his practice in Rosemead, said 10 doctors who went to medical school in Vietnam before 1975 died at sea. And their names will be on the monument. "I ask myself this question all the time: 'Why did I make it and they didn't?" he said. Le, his wife and daughter, who was then 4, endured storms and pirates on their way to Thailand. "The line between life and death in the high seas is very thin, almost invisible," he said. "We were lucky to survive. A lot of people were not."